Which mid-major team will bust brackets in this year’s NCAA Tournament? Here’s a look at four candidates poised to pull off upsets. One of my favorite things about the NCAA tournament is seeing how smaller programs stack up against schools from the power conferences. Mid-major teams don’t often get the same publicity as their much larger opponents, but each year there a few teams from smaller conferences that show up in March and prove that they belong with the big boys. Last season it was the Ramblers from Loyola-Chicago upsetting multiple teams to get into the Final Four. This year the Gonzaga Bulldogs record of 30-3 earned a rare number 1 seed for a mid-major program, but the Zags’ sustained excellence has almost been expected. Gonzaga isn’t the only mid-major program that is poised to make some noise in the NCAA Tournament though. Wofford, Utah State, Murray State, and Buffalo have shown all season long that they have what it takes to compete with any team in the country. Below are a few plays that these mid-major teams run to get a bucket for their go-to players, and putting themselves in a position to win. Click on a diagram to add it to your FastDraw library, and check out our guide on How to Maximize March Madness. Wofford currently has the longest winning streak at 20 games and looks to get their first tournament win as a program. They are one of the best 3-point shooting teams in the country, making 11 3’s a game and shooting 42% (2nd in Division 1). 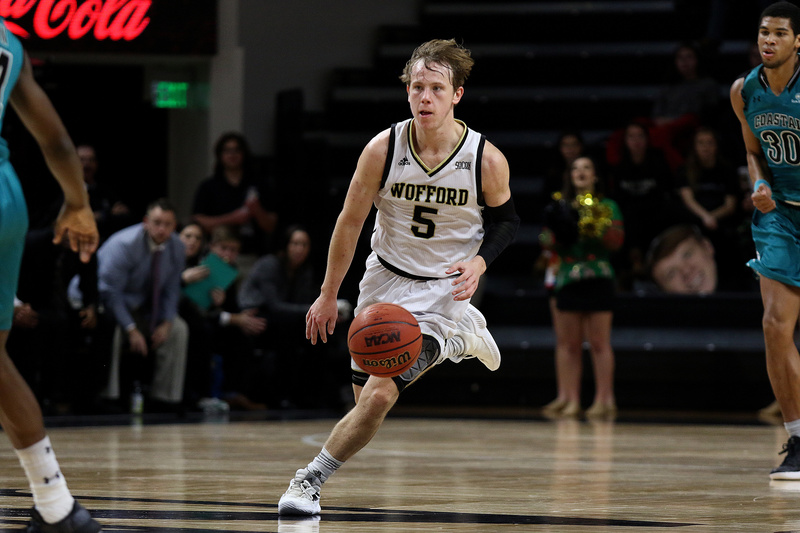 The Terriers are led by senior guard, Fletcher Magee, who enters the tournament two made 3-pointers shy of the NCAA Division 1 all-time record of 504. Here is one of Wofford’s go-to plays to get Magee open off of screens in order to utilize his quick release. Magee (2) starts the play by making a slow cut under the basket to set himself up for a baseline screen. 1 dribbles off of the ball screen from 4 and passes to him up top. Once 4 get the ball, 2 sprints off of the screen from 5 to get open in the corner. 2 catches the pass from 4 and looks to hit a three-point shot. After winning the Mountain West Conference Championship, the Aggies received their highest seed ever at 8. Junior guard Sam Merrill leads them with 21.2 points per game. He is an elite scorer who can create his own shot off the dribble and knock down open looks off of screens. Utah State frequently runs this play to get Merrill the ball coming off a screen, where he can attack the basket or take the open three. The first option looks for their second-leading scorer, Neemias Queta, to get the ball at the rim off a double back screen. Merrill then receives a stagger screen to get the ball at the top of the key. Murray State has made headlines this year with their exceptional point guard Ja Morant leading the way with 24.6 points per game. Morant is not just a scorer, though. He also averages 10 assists a game as the Racers run their offense through him. They like to get Morant open in transition or off of ball screens so that he can use his athleticism and finishing ability to make plays at the rim or to create open shots for his teammates. When the Racers have to run a half-court set it will usually be a ball screen for Morant. This play combines multiple actions to make the help on the screen late so the point guard can attack and get in the lane. 4 starts the play with a pindown screen for 3. 3 curls around the screen to set down screen for 5. By having 5 use a screen in order to sprint into the ball screen it gives him a head start on his defender and makes it difficult to provide help on 1 coming off the ball screen. Last season as a 13-seed, Buffalo provided one of the most shocking upsets of the tournament in blowing out 4-seed Arizona. This year Buffalo enters the tournament as a 6-seed with a 31-3 record after being national ranked for most of the season. The Bulls are led by MAC Conference player of the year CJ Massinburg and his 18.3 points per game. Massinburg is an exceptional scorer who excels at getting in the paint to finish. Buffalo runs this play to get Massinburg (3) the ball off of a handoff where he can turn the corner and attack the basket. The play starts with 5 setting a decoy screen for 4 to initiate movement. 1 then dribbles off of the ball screen from 5 to hand the ball off to 3, who is cutting out of the corner. 4 & 5 cut to the right side of the floor to open up the left side for 3 to get to the rim. Enjoy the tournament everybody, and remember – watch out for the mid-majors! Follow #FastModelMadness on Twitter to join the conversation with coaches during the NCAA Tournament!